The cardigan uses Green Mountain Spinnery New Mexico Organic, which is a DK/light worsted wool and was absolutely a treat to work with. This sweater is just right for something a little bit wooly to let those structured cables stand out. I’m pretty sure I will be casting on one for myself before the season is over, because, well, I want one too. I hope you’ll enjoy perusing the entire Winter issue, though, because the entire selection is really fabulous. In other news, my current sweater in progress is making its way, and just lacks about a sleeve and a half and some finishing. 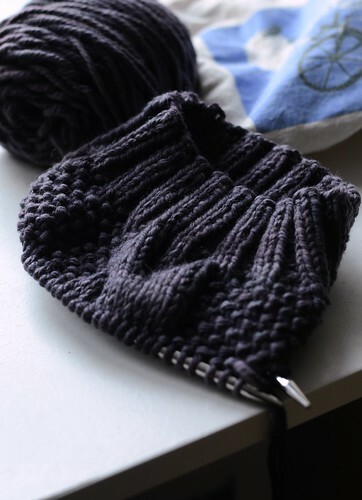 It’s in my favourite go-to yarn, Cascade 220 Heathers, and I’m enjoying how it’s turning out. (This is, incidentally, the long-awaited sister sweater to Royale, and will be a cardigan – with a few tricks up its sleeve, which I’ll be sure to tell you all about later when it’s done!) Just need that final push to get ‘er done. There has also been some stockinette knitting, some sidelong glances at the ribbed sock in progress that’s been in my handbag for about two months now, a lot of yarn stash pondering, and an invigorating exchange with Fiona yesterday about knitting her Bonnie sweater since I’ve had the pattern and wool sitting idly by, ready, for about two years now. (Except I’ll probably throw in some waist shaping, add a bit of length if my yarn quantities allow, maybe cardiganize it, you know. The usual.) Hey, it’s coming on winter and a knitter’s hope springs eternal, what can I say? This weekend I look forward to more knitting, and paying a visit to the Purple Purl in Toronto, where they are celebrating five years of business. Hurrah for local yarn shop birthdays! Have a great weekend knitter friends, I hope you get some good knitting time in. 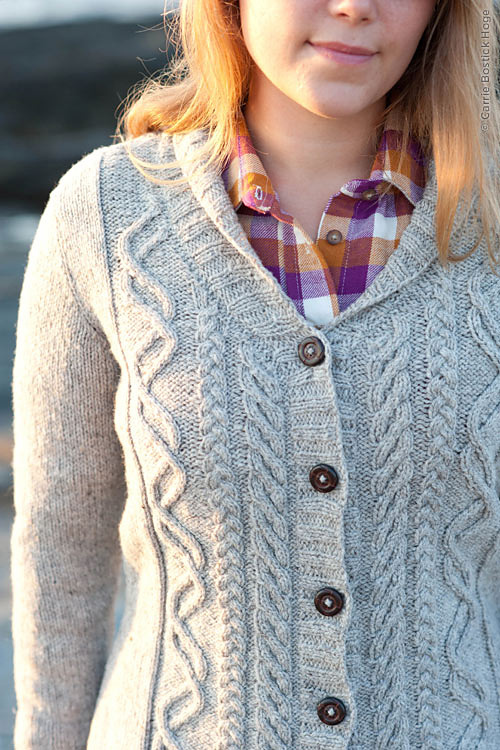 I think that may be my favorite sweater in the current TC! Unfortunately the smallest size would be way big on me, so if I make it, I’ll have to adapt gauge or mess around with the numbers in order to make it fit me better. Could be worth it, though. I love that cable pattern! Cardiganize. It’s such a great term that I’m pretty sure it will become a neologism in no time! 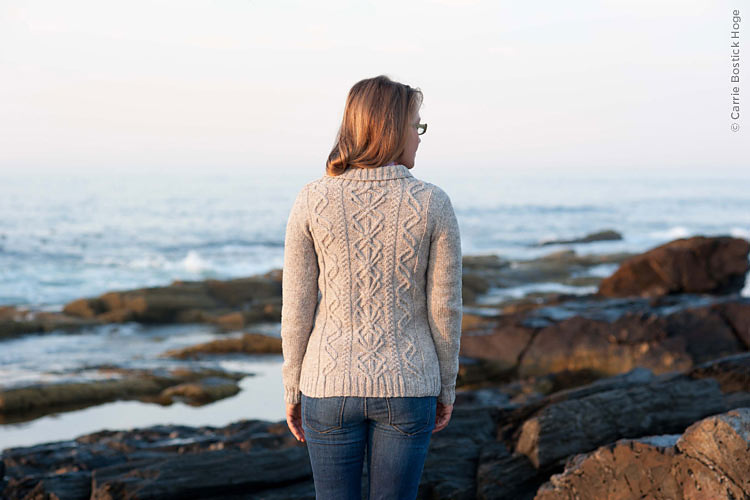 Congrats on the newly published cardi pattern! Crikey you do a good job juggling all those projects at once! I’ve got a baby blanket that needs knitting and sewing up before I can get back to my jumper…. love your work! oooooooh I love that heathered purple goodness. Congrats on the Twist sweater; it’s always so exciting when something goes live! How ever do you manage to do so much all at once? Some days it’s all I can do to keep the kitchen clean (sort of). Beautiful sweater in the TC, Glenna! Now to learn how to make all those wonderful designs 🙂 Soon! Beautiful cardi…but that purple heather business makes my heart go pitter patter. Never met a purple I didn’t like! THAT WAS YOU?? I bookmarked that pattern last night and was looking on spinnery for the yarn. Seriously, that is amazing work. You have great style. Love, love, love, but of course I live all your designs Glenna! Thank you! 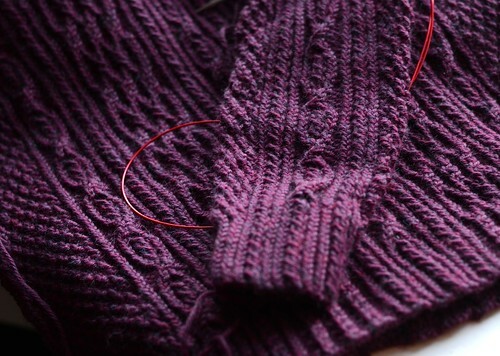 I’ve got some lacy socks-in-progress awaiting me… Lace is my favorite, but gosh you make cables look yummy. Congrats on your sweater being in the magazine – it looks awesome! I would say you accomplished quite a bit this week – more than me! Everything looks great! love the new sweater….just not sure if I’m ready again for the big “c”word. Wow Glenna, you really rock cables! I made your “Marching On” socks a while back and I see the same cable genius in the sweater(s) above. Love that big grey seed stitch in the picture too! Love the sweater pattern, thanks for sharing.